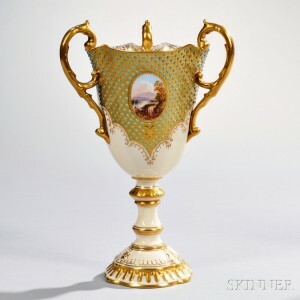 Collecting Jeweled Coalport Porcelain | Skinner Inc. Established in 1795 in Shropshire, England, Coalport porcelain has a long and storied history of quality craftsmanship dating to the late 18th century. The manufactory produced both ornamental and table wares, beautifully decorated, in a very high standard to meet the demand of discerning patrons. Late in the 19th century the Coalport manufacturers added yet another specialization to their repertoire of hand decorated porcelains. A technique called “Jeweling”, whereby small beads of colored enamel were applied most often to a gold ground, possibly first developed and introduced by Worcester porcelain manufacturer in the mid 1860’s. Turquoise seemed to be a prevalent color of this jeweling, meticulously and uniformly decorating tea wares, useful wares and ornamental wares, often accompanied by a rich raised gold decoration were produced for sale in Britain and abroad. 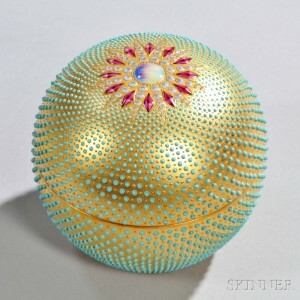 Examples seen at auction include covered vases and boxes, tea cups and saucers and other decorative accessories. Select examples are ornamented with hand painted cartouches, some simulating gems such as moonstones and opals bordered with rubies and emeralds, and others with portraits. Certainly specimens that included both jeweling and gems appeared at a higher price point than those pieces with either jeweling or gems, and pieces featuring minimal jeweling offered at a more conservative price at the other end of that spectrum. In an effort to maximize the success and keep up with the demand of this jeweled porcelain, at the expense of accomplished artisans, Coalport streamlined the process of jeweling circa 1896, implementing new techniques allowing for accurate and far less expensive application of these enameled jewels by far more inexperienced decorators. This entry was posted in Blog and tagged artisans, auction, boston, boxes, Coalport, enameled jewels, England, European Furniture & Decorative Arts, jeweled Coalport, jeweling, ornamental wares, porcelain, private collection, skinner, tea cups, tea wares, turquoise, vases by Stuart Slavid. Bookmark the permalink.